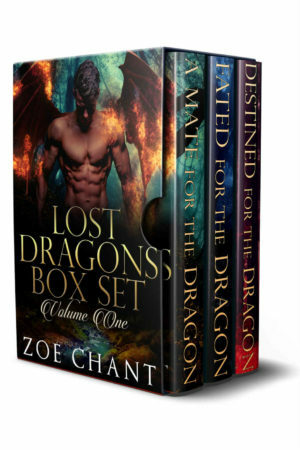 In this box set you'll find the first three books of the Lost Dragons series. Each stand alone romance includes heart-pounding action, steamy scenes, and absolutely no cliffhangers. Dragon shifter Stefan Novak is the last of his clan - and unless he finds a mate soon, his lineage will die with him. But Stefan knows that even if he finds his mate, she too will be in deadly peril from the rival dragon clan who is hunting him. He's made up his mind he won't seek out his mate, even if it means he'll be alone forever - but he doesn't expect his mate to come looking for him. All his life, Isaak Vallas has been tormented by the beast that lives inside him. Desperate, he retreats to his private island, hiding away from the world in fear that his dragon will slip his control and hurt someone. But when a curvy beauty breaks into his self-imposed isolation, Isaak just might have found the one person who can calm his beast and heal the conflict inside his tortured soul. Dragon shifter Magnus spent years as the captive of an evil dragon hunter. With no memory of his family or clan, Magnus is cut off from his hoard and his heritage – until one touch of a mysterious woman's hand sparks memories within him he’d thought he’d lost forever, and stirs his soul in a way he's never known before. There's just one problem: she's a dragon hunter, and she's been sent here to kill him. Now you can save 30% on the first three books with this convenient box set. Contains strong curvy heroines, protective heroes, breathless action, sizzling romance and fated mates whose love overcomes all obstacles. One-click now for three steamy and heart-warming stories of passion that lasts a lifetime!